The train line opened in 1846 as a section of the important link between London and the Royal residence at Windsor. Routing note: This walk connects in Barnes with Waterloo network walks 2 and 3. 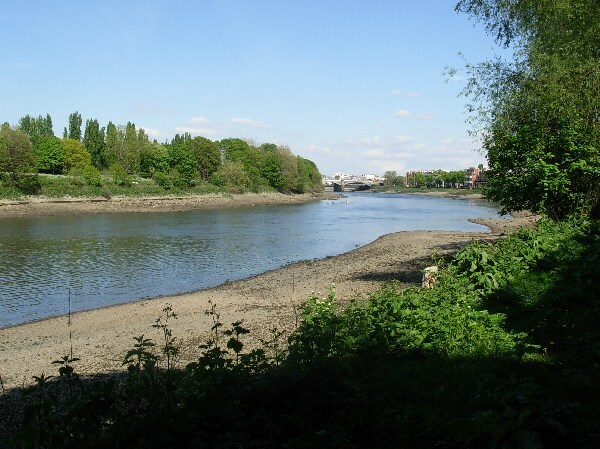 It connects in Richmond to Waterloo network walk 6 and to Overground network walk 19. 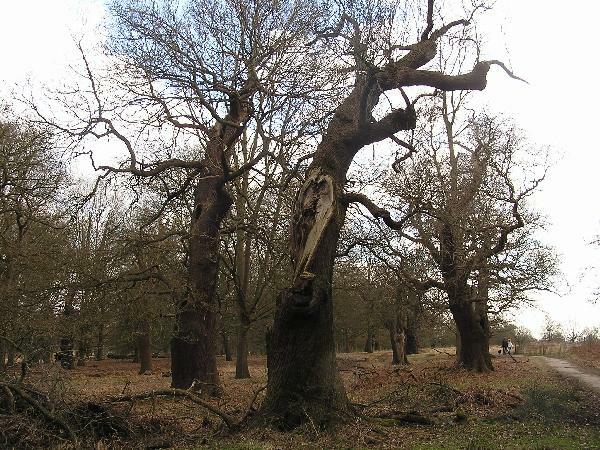 The long option mentioned in the title involves visiting a large part of Richmond Park and sturdy footwear is advisable. 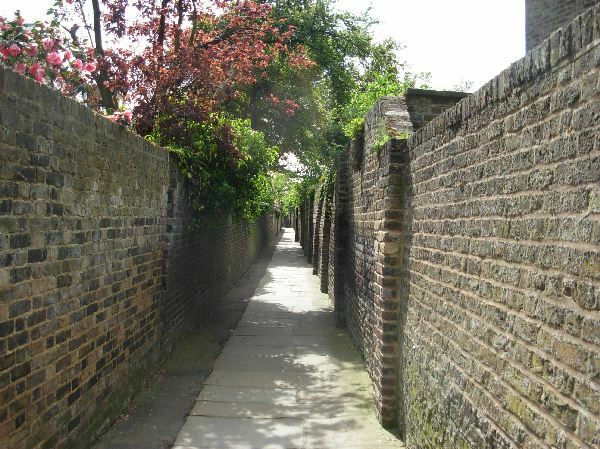 Although I mention roads in my route because they are easier to follow, I would certainly recommend you walk on parallel informal paths whenever you get an opportunity. Maps show a number of paths but are not very reliable in this respect. 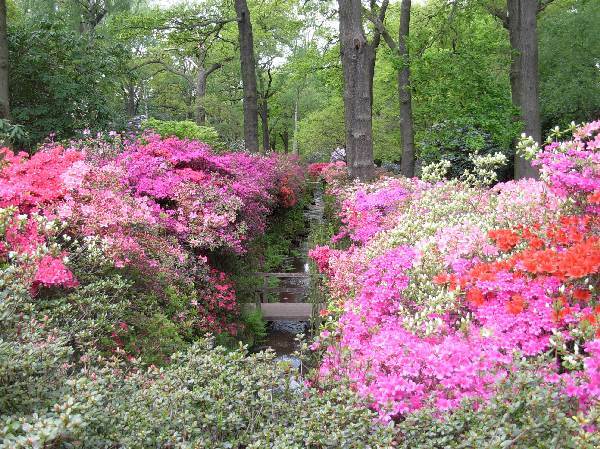 The best season to take the long option is rhododendron season in May. 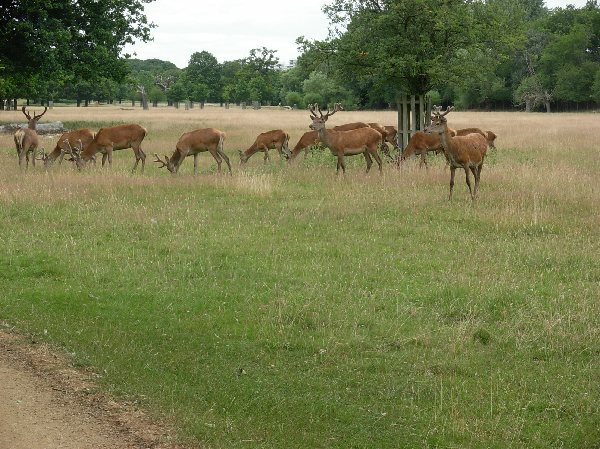 Note that the long option is not recommended if you take your dog because it is mandatory to put your dog on leash while in Richmond Park, which may take away some of the enjoyment. The station opened in 1846 together with the train line. The station building is the original one. It is a highly unusual building for a train station, much taller with much more pointed roofs than you would expect. 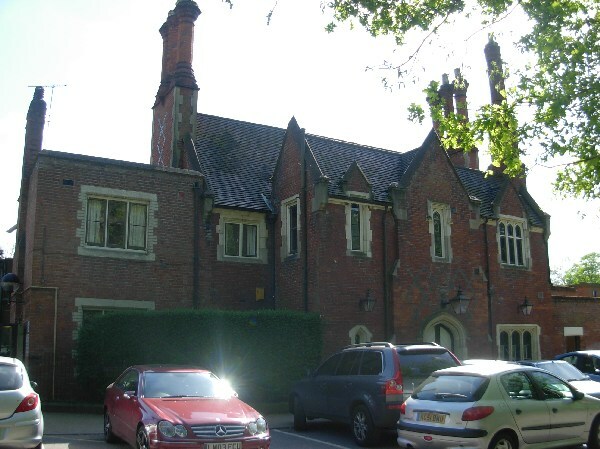 The main façade, made of red bricks, also incorporates a chequered design in black like Tudor palaces. This led to the style being described as “Tudoresque Gothicism”. The train company board discussed such detailed design issues as the type of chimneys, that were to be in a style fitting with the rest. There is apparently no information available about the architect, who also designed two other, much smaller stations on the same train line. Those two were replaced later on. You cross only a small part of the common as most of it in on the North side of the tracks. On average, Barnes Common is more lush than most with walkers apparently keeping to the paths. 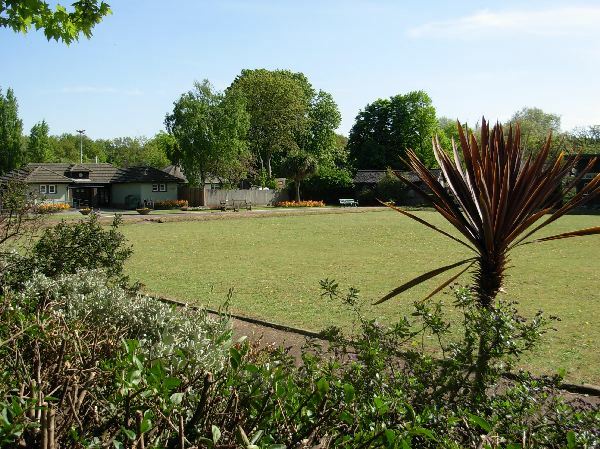 The path leads along a pleasant recreation ground that looks particularly nice on my picture because of the exotic plant on the edge of the bowling ground. The river already feels quite rural here. 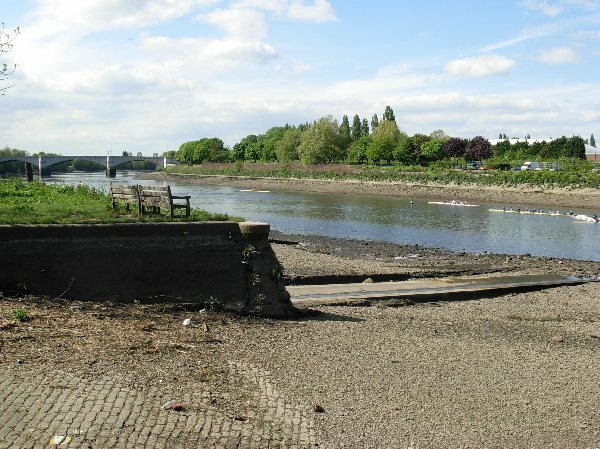 Mortlake is one of the most interesting places to go to when tide is particularly strong. 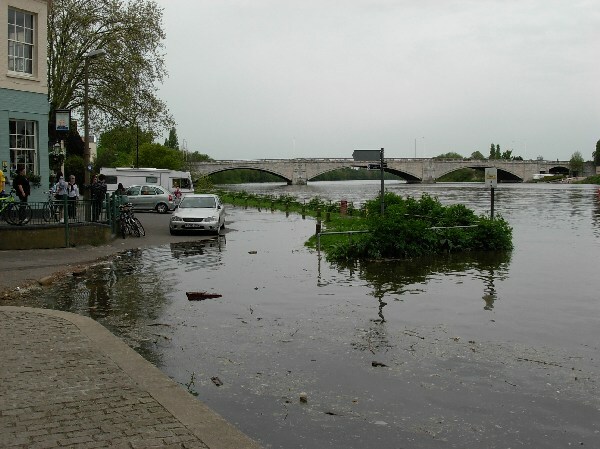 Because the river is relatively narrow and constrained by a lock not far upstream, very high tide can lead to flooding of the riverside path and this can be fun because the patrons of the riverside pub are often unaware of the risk and end up wading through the water to drive their car away at the last minute. For some reason, I took no pictures of the church. 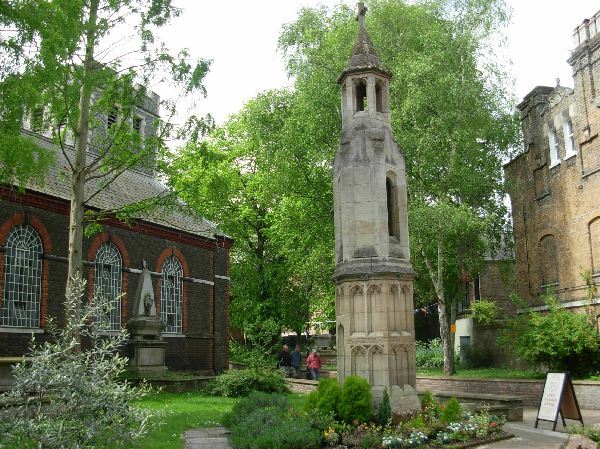 It was built in the usual Tudor imitation style between 1885 and 1905 although the tower is older (1563). The station opened together with the train line on 1846. The original station building has been demolished. The present amenities are housed in a modest brick cube that looks late Victorian. The platform awnings are actually nicer than the ticket office. 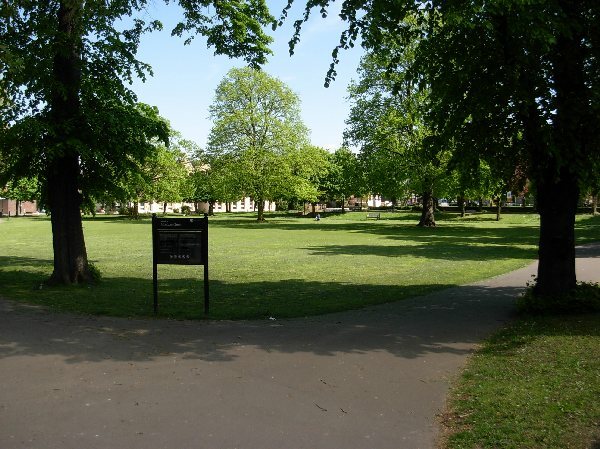 The green is a pleasant neighbourhood park given by a local landowner in 1860. There are no spectacular flower beds or works of art. My picture shows a large factory here, something unusual in the western suburbs nowadays. 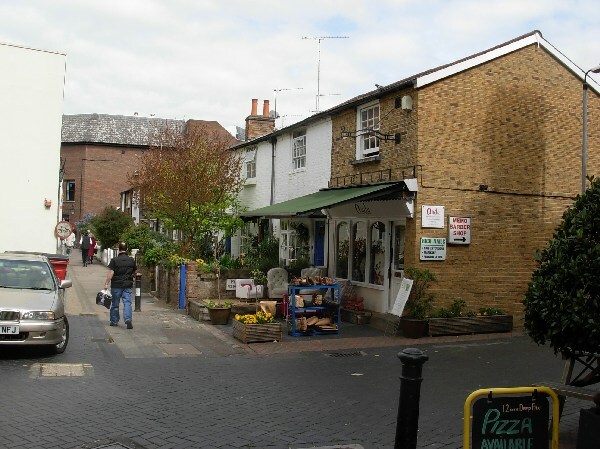 There was a brewery in Mortlake as early as the 15th century, that on the picture taken in 2010 belonged to a multinational corporation. 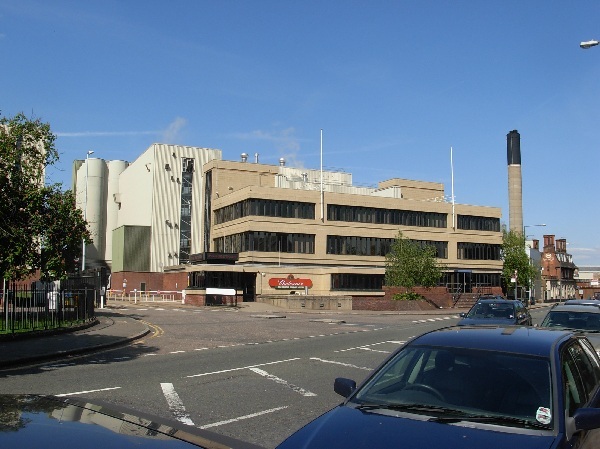 The site was sold to developpers in 2015 and will be converted into luxury flats. The station opened in 1930 on the existing train line, which explains why the platform had to be squeezed between the tracks. It also explains why there is no station building, just a wooden ticket office on the platform. 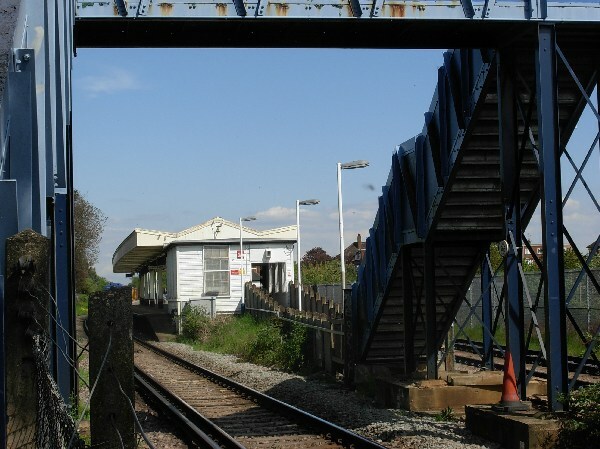 Access is rather inconvenient: despite the level crossing used by Manor Road very close to the station, the only access to the platform is through a footbridge. This makes sense because the train line is extremely busy, causing the level crossing to remain closed for lengthy periods of time. 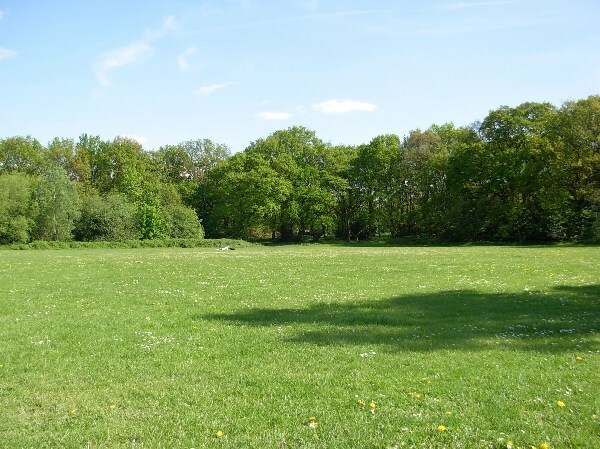 The common is wooded and is a small remnant of the original acreage. 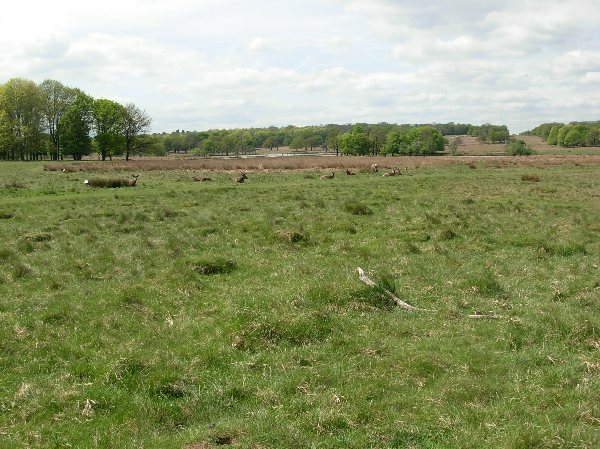 Most of it was enclosed in the 17th century when His Majesty decided to set up Richmond Park as a game reserve. 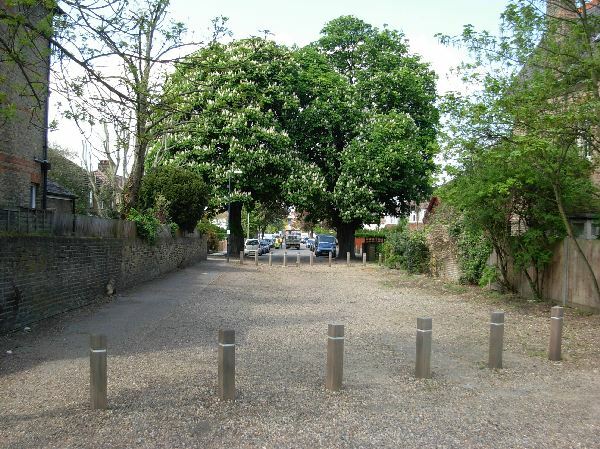 There are a few sports facilities in the common and the borough wanted to add a children’s playground, but local citizens proved very divided with strong opinions about whether to give up part of the wood for this purpose, so that nothing happened. 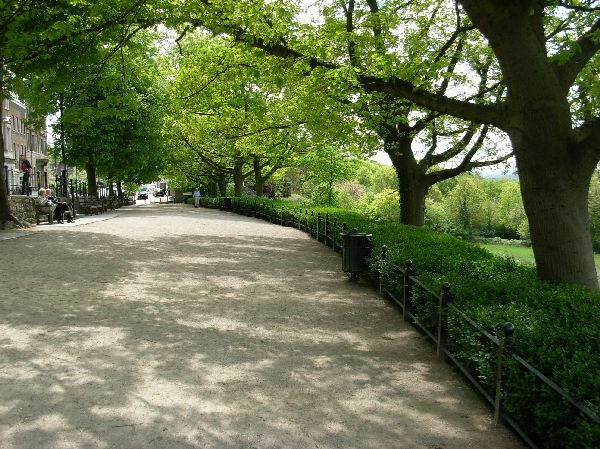 The park is the largest of the London Royal parks and is about the same size as the two Paris woods, Bois de Boulogne and Bois de Vincennes. Like those, you can find in the park a few buildings that are now of historical interest. 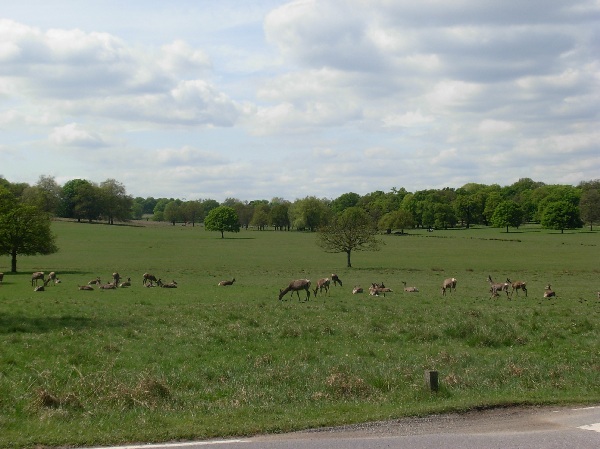 Unlike the Paris parks, Richmond Park is enclosed and therefore sustains a large population of deer. 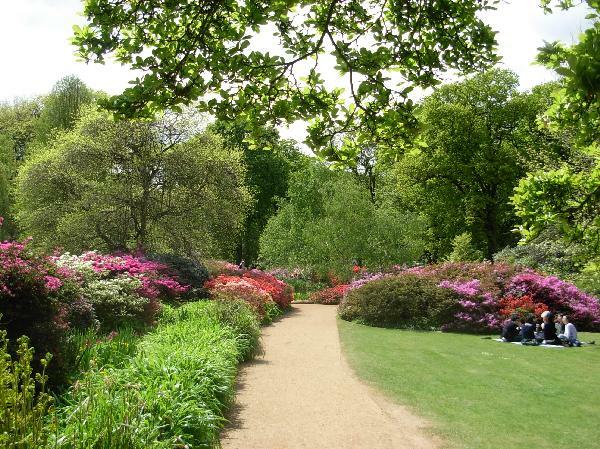 This implies that wooded sections have to be enclosed to protect them and are not accessible to visitors except for the rhododendron dell called Isabella Plantation. 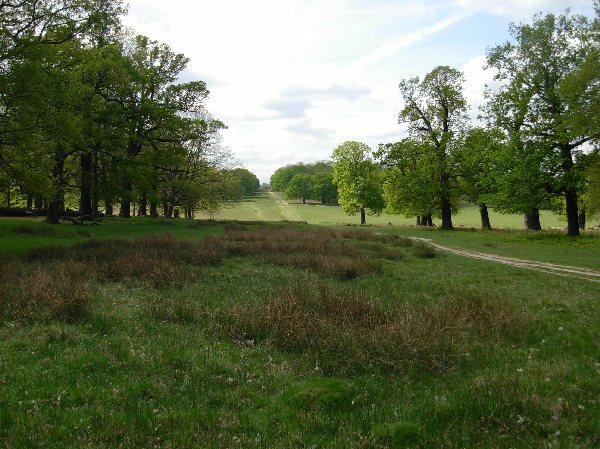 You may also want to be aware that Richmond Park deer are notorious for carrying Lyme disease, so that contact should be avoided. 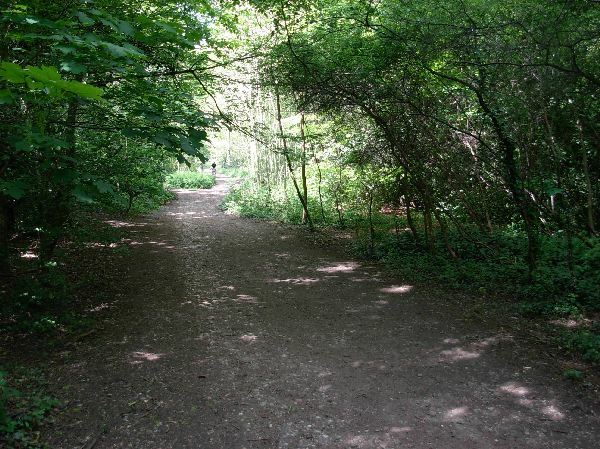 R onto the cycling track or on paths close to it for about 1/2 mile until you reach a road. About half way, the cycling track passes a stately building painted in white on the left. 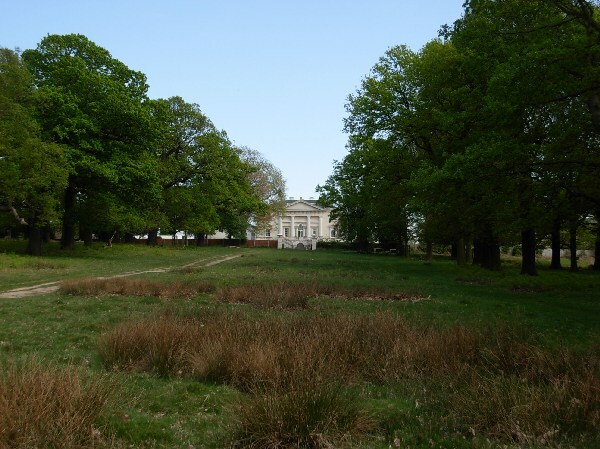 The White Lodge was built in 1730 as a hunting lodge for King George II and remained often used as a Royal residence until 1925. It has been used by the Royal Ballet School since 1953. There is a very long straight track leading away from the building. This is Queen’s Ride, one of the nicest perspectives in the park. 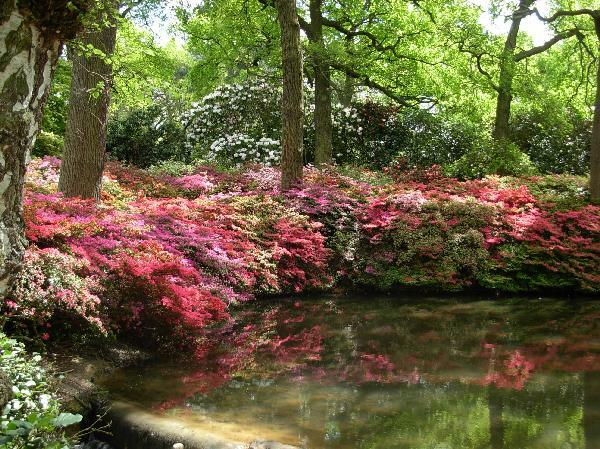 Isabella Plantation is enclosed woodland protected from the deer since the beginning of the 19th century and has been opened to the public since 1953. 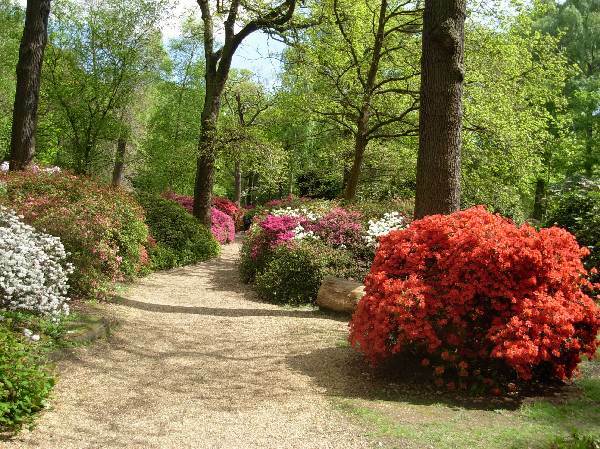 It has become well known for its magnificent collection of azaleas and rhododendrons although it was announced in 2012 that a significant part of the rhododendrons belong to an invasive species that is to be eliminated. 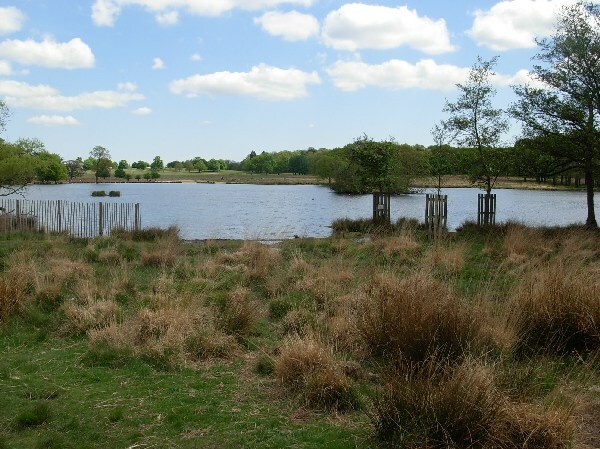 The Pen Ponds were dug in 1746 in order to enable carp rearing. They are fed by the underground water table and are actually also meant as a means to drain boggy ground. The huge building on the left side is a former retirement home converted by a developper in 2014 into luxury flats. The location affording a remarkable view over the Thames meadows, businesspeople built an inn in the late 18th century and this was converted into a hotel in 1803. The first owner ended bankrupt after four years and the following manager got a reputation for charging shockingly extortionate prices. This was justified in a way as the hotel was seen as the most glamorous in Britain. The hotel closed at the end of the 19th century and the present building was set up between 1916 and 1919 as a home for young soldiers disabled during World War I. Some of them found employment in a factory set up on the same road to produce the remembrance poppies still sold every year in November for charity. As a foreigner, I was quite surprised at how important poppy sales are in offices and shops throughout Britain, with even City speculators feeling socially obliged to pin poppies to the grills of their luxury cars. It must be a sort of collective atonement for spending the rest of the year bothering only about “how do I get as rich as possible as quickly as possible without any regard for anything else”. After World War II, the soldiers’ home turned over time into a retirement home for the military but was inconvenient for modern care and has been sold for conversion into luxury flats. The 19th century hotel was heavily criticised for being very conspicuous and spoiling the landscape, but people have got used to it over the years. The current architecture is imposing but somewhat bland, possibly because it was a compromise winner in the design competition or possibly because of cost issues. The architect, Edwin Cooper, built very impressive neo-classical buildings in his later career. 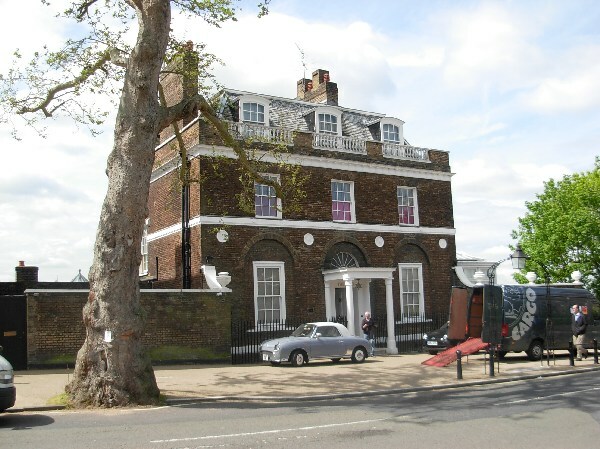 Shortly after the hotel, you pass Wick House, the residence built in 1772 for celebrity painter Sir Joshua Reynolds, first president of the Royal Academy of Arts, who definitely had an eye for a good location close to Royal residences. The building was used in the 20th century as staff accomodation for the nearby retirement home but no decision has been taken as of 2015 about its future use. 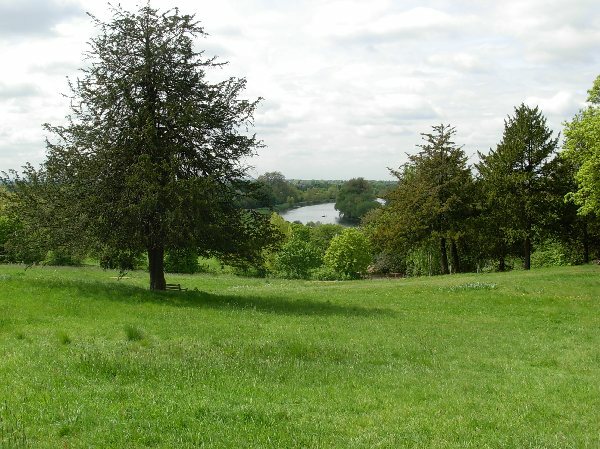 From Wick House and from the road just afterwards, you can enjoy the celebrated panorama of the Thames meadows towards Petersham and Ham House. The view is described with enthusiasm in numerous literary works of the 19th century and was also painted a number of times. It is the only view protected by a specific Art of Parliament (since 1902). 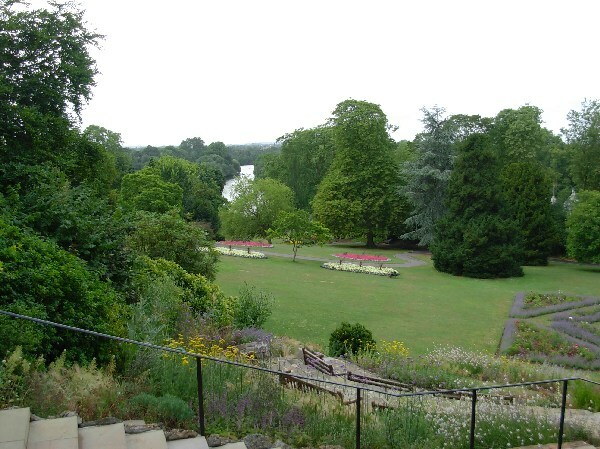 From Richmond Hill, you can easily see the steep slopes of Terrace Gardens. Surprisingly enough, this magnificent municipal park was landscaped on the grounds of brickworks. 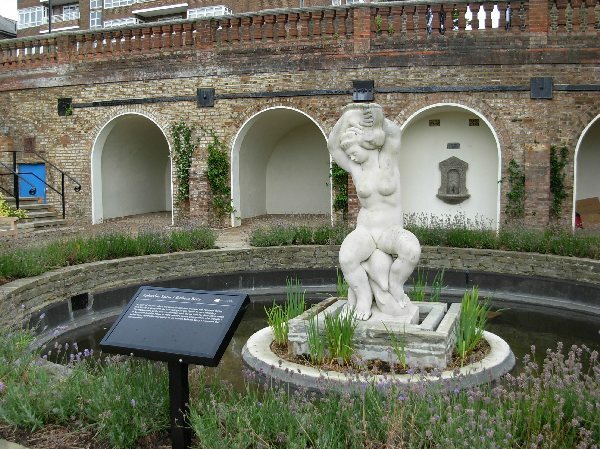 The top of the park is a combination of brick terraces with a statue of a very naked woman cavorting on a dolphin. This is a work by Allan Howes who was a well-known sculptor in the mid-20th century and the statue is indeed much in the style of the 1940s. The statue attracted passionate debate when it was set up in 1952, apostles of morality thundering against the shamelessness of the figure and pointing out that children and gentlemen would be as offended by it as ladies are by Father Thames statues. The statue did get the byname “Bulbous Betty” but managed to survive the onslaught. Betty is actually the Greek goddess of beauty Aphrodite. 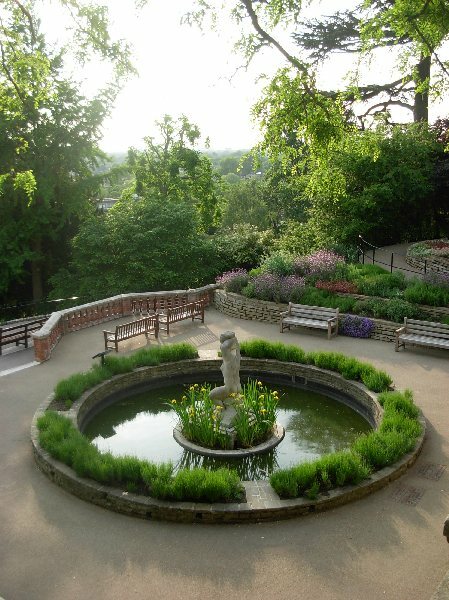 Descending into the gardens, you can pause at several levels on convenient benches and enjoy the views. 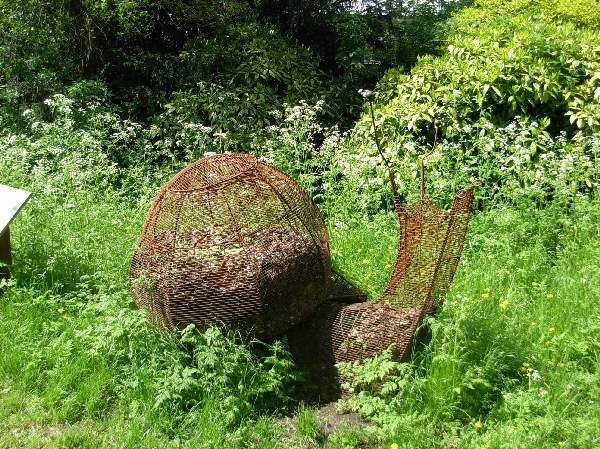 There is also a wooded section as the northern end of the park with a rather intelligent way of disguising composting heaps in the shape of iron animals like the snail on the picture. 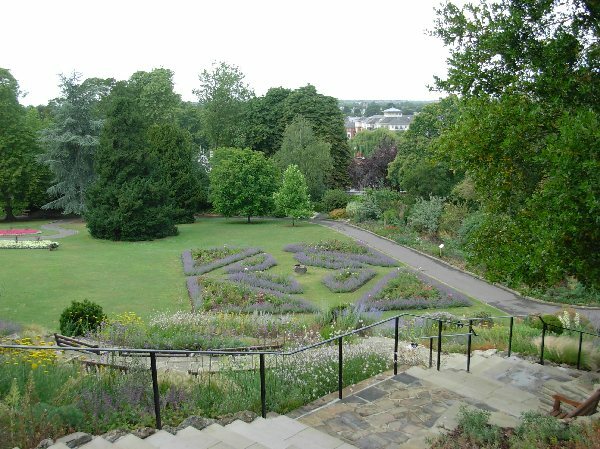 From the intermediary terraces, the most conspicuous view is that of the starkly geometric rose garden with lavender borders. The combination is quite traditional but you don’t get often an opportunity to view such designs from above. 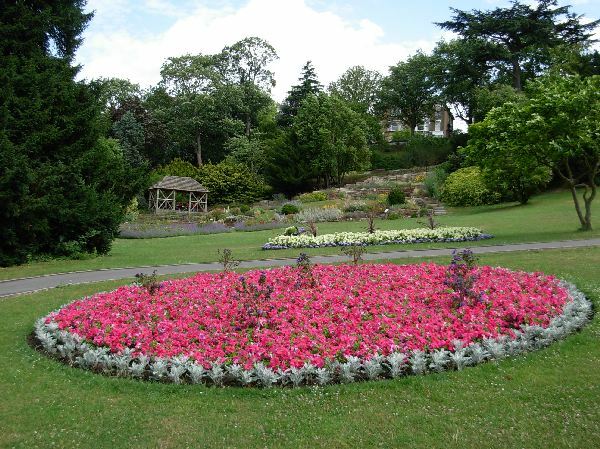 Passing the rose garden, you are in the lower part of the gardens with a small Conservatory where you can have a look at a few exotic plants. 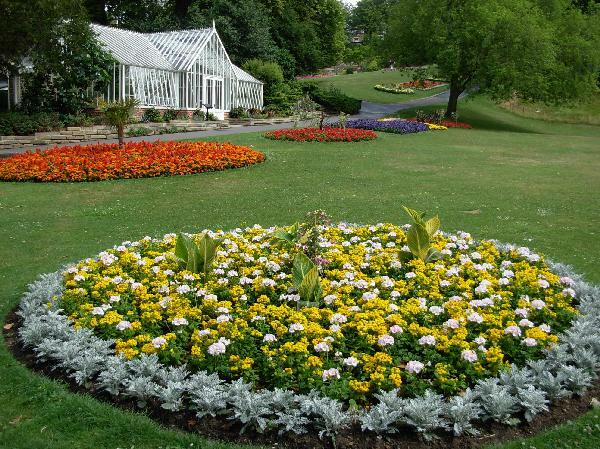 I spent more attention on the circular flower beds. 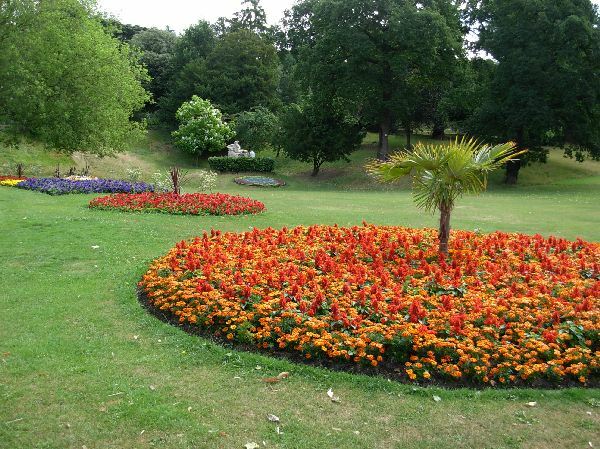 The mass of plants of a single colour produces very striking effects, particularly in summer (the pictures are taken in July). 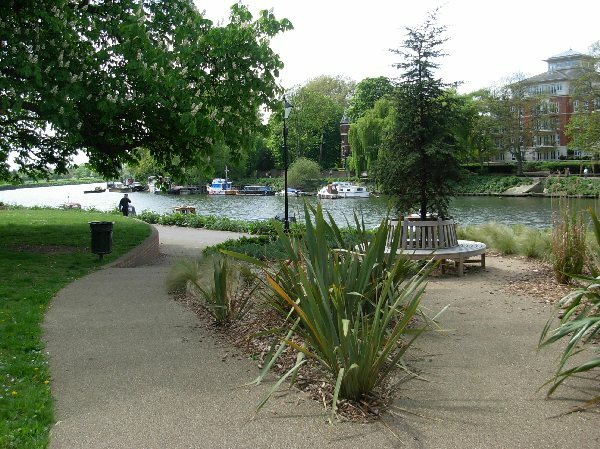 You can go for a few steps on the riverside walk along the road in order to enjoy the view. It is peaceful on weekdays but is quite crowded on weekends and the buildings on the other side of the river are not particularly exciting. 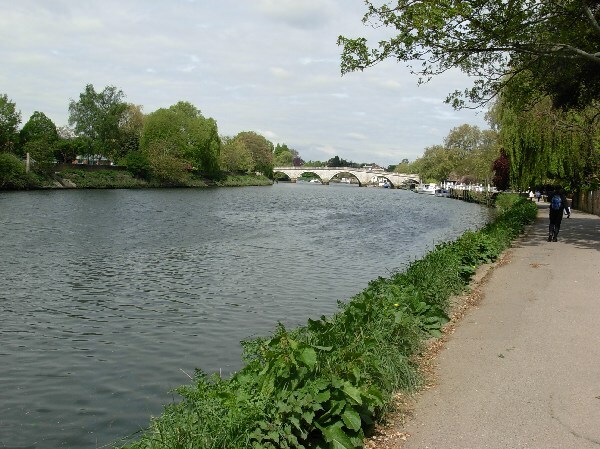 The view downstream goes towards Richmond bridge, originally built in 1777 as a private toll bridge. Access is free since 1859 and it is the oldest bridge over the Thames in London existing in its original form. At the corner with The Vineyard, you pass a slightly unusual church building. It was built in 1851 and combines Norman-style arches with some neo-classical proportions and a flat roof with a very conspicuous cornice. The combination of arches and counter-curves on the front façade is unusually creative. 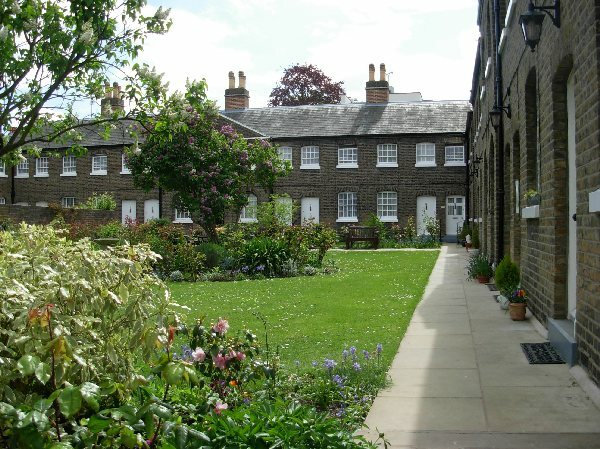 Along the road, you soon pass a quiet green space, the private garden of Michel’s Almshouses. The ten houses were built originally in 1696 on the basis of Mr. Michel’s bequest and rebuilt in 1810 without any unnecessary decoration. 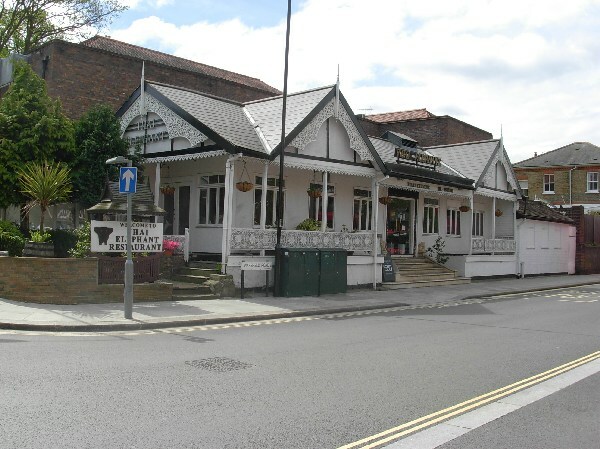 There is a rather unusual restaurant building on this road that reminds heavily of colonial bungalows. I say unusual because you would expect the building to have been replaced by a block with several storeys in order to take advantage of the value of land in central Richmond. 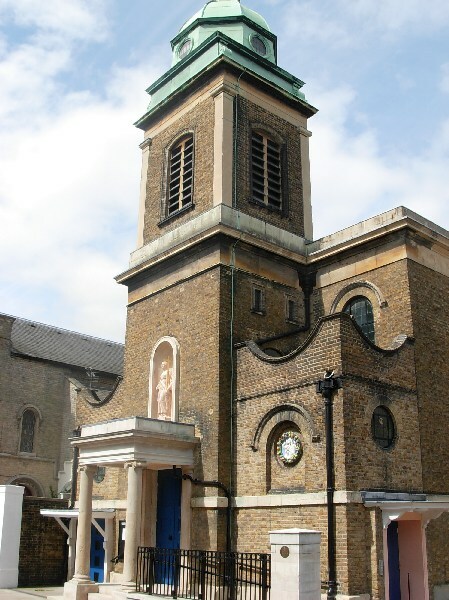 The parish church for Richmond sits at the corner of Paradise Road with Sheen Road. There has been a church here since the Middle Ages but the present building is the usual mix of 19th century extensions with a few later additions. I was unable to enter the church; according to the website, there is nothing remarkable inside except for a few funeral monuments. In the small garden on the side of the church, you will find a war memorial in a rather unusual style. It is not the municipal war memorial and must be connected to the church considering its gothic appearance reminiscent of Charing Cross. 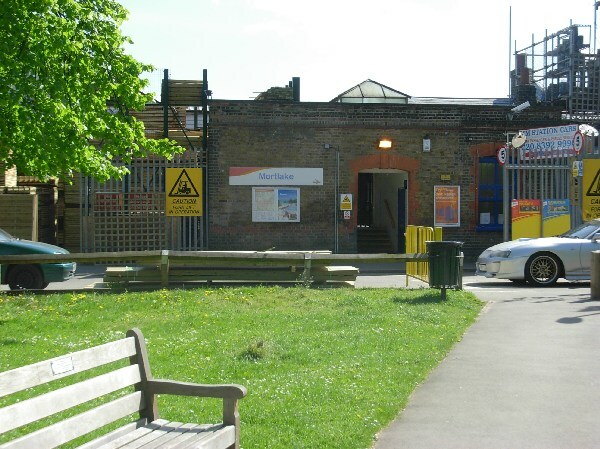 The station opened in 1846 as the terminal for the new train line from Clapham Junction. The line was extended as soon as 1848 towards Staines. A junction opened in 1869 offering services towards Gunnersbury and station on the left bank of the river Thames. The junction normally works as a terminal, so that the platforms for the 1846 and the 1869 lines are fully separated. Changing trains in Richmond on an Oyster pay-as-you-go card can therefore cause unexpected charges because of the unclear touching instructions and intransparent software. 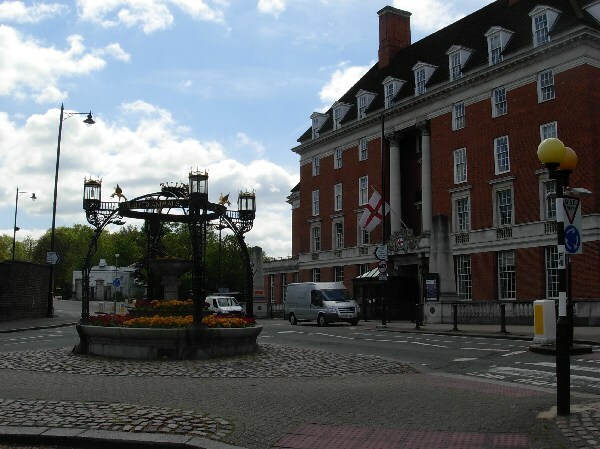 The station building is sizeable, as befits an important town like Richmond. 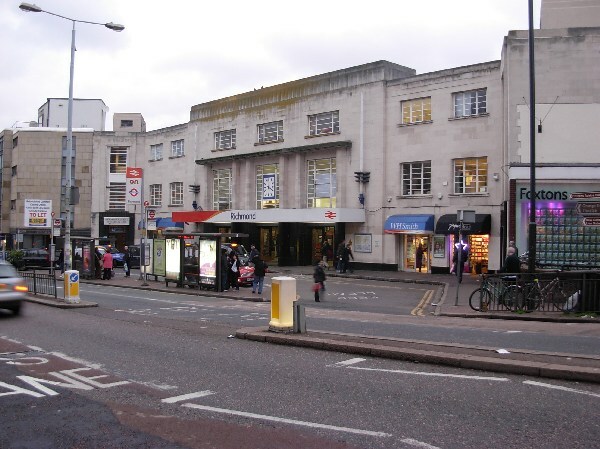 It was built in 1937 in a moderate Art Deco style. The many large windows meant to give much light into the concourse are typical of the style. You will be a little surprised to note that you go down stairs into the concourse when entering the station from the road. It is usually more convenient to have stairs only for platform access.